Now too long ago, Credo Mobile launched an unlimited LTE data plan available for those with two lines or more. Now the company is offering the plan for those with a single line. Credo's unlimited LTE data plan is priced at $80/month plus taxes and fees, which really isn't a bargain when compared to other Verizon MVNO's, Verizon itself, or even other unlimited LTE data plans. In fact, I'm not even sure Credo should be calling this an unlimited plan given that they aren't even applying a data prioritization policy to it, but rather are throttling those who consume more than 20 GB of data in a month to paltry data speeds of 64 Kbps. For this reason, you won't see Credo's new plan listed in the unlimited LTE data plans table. This should simply be called Credo's 20 GB data plan. The listed prices don't include taxes and fees, and Credo also charges line access fees for devices that include a $20/month fee for devices purchased on an installment plan and $40/month for devices purchased on a two year contract. 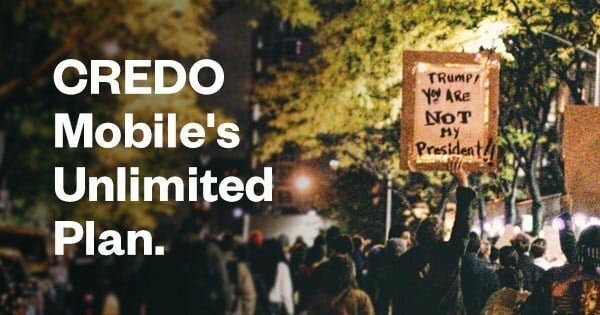 Credo Mobile is a postpaid wireless MVNO that was founded in 1985 and it is a politically charged MVNO that uses some of its revenue to advance progressive causes. For instance the company is currently marketing itself as "the only carrier fighting Trump’s hate.” If you look at the Credo Mobile blog or even the companies Twitter account you can see just how politically active the company is and where your dollars are being spent if you sign up for service with them. Doesnt Verizon offer Unlimited Verizon data for $80 a month?